This was a creamy sweet smoothie with more spiced flavor than I expected from the ginger and the nutmeg. The boys wanted to eat this frozen; so I put their cups in the freezer for a couple hours. They ate it with a spoon and called it ice cream for their dessert after dinner. Layer the first three ingredients in the blender in the order listed above. Puree until smooth. Taste the smoothie and add honey if desired. Add a sprinkling of the spices and blend to combine. Enjoy! Excellent - Love smoothies and like the addition of ginger in this. I give my girls smoothies almost every morning before school - so it's great to get a few more recipes! Making this. 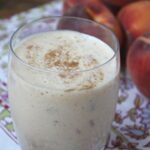 I always new new smoothie flavors to try and peach and ginger combo is one of my favoorites! I like this one a lot! I am a huge fan of ginger (ever since my days of morning sickness....)I'm sure it adds some great kick to it..